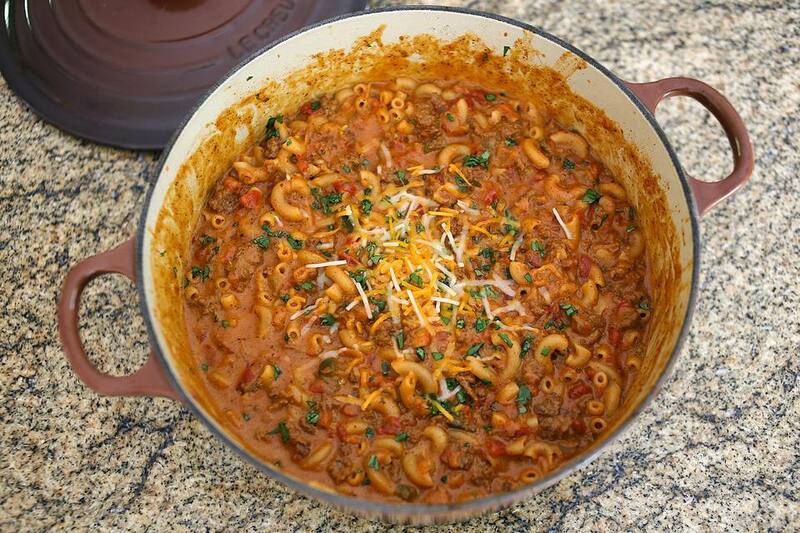 This one pot macaroni and cheese is made with lots of cheese, ground beef, and some spicy chili seasonings. Add some diced hot peppers if you like a little heat. Jalapenos or mild chile peppers may be added. Serve this easy stovetop mac and cheese dish with a simple salad and biscuits or cornbread. In a large Dutch oven or saucepan, heat the olive oil over medium heat. Add the onion and bell pepper and cook, stirring frequently, until onion is lightly browned. Add the ground beef and cook, stirring, until the beef is no longer pink. Add the garlic and cook, stirring, for 1 minute longer. Stir the chili powder, salt, cumin, and freshly ground black pepper into the ground beef mixture. Pour in the chicken broth and tomatoes. Add the macaroni and bring to a boil. Reduce the heat to ​medium low and cook, stirring frequently, until macaroni is tender, about 8 to 10 minutes. Add the cream and cheese and simmer for about 2 minutes, until heated and most of the liquid has been absorbed. Garnish with chopped cilantro or parsley, if desired. Serve with a salad and cornbread or biscuits. Use a cheddar jack combination of cheeses or taco seasoned cheese in the recipe. Add about 1 cup of canned drained black beans to the dish.